Roger Harrabin of the BBC wrote an excellent piece on the non-existence of ‘road tax’ (it was also a news segment on Radio 4’s Today programme). Naturally, this was a lightning rod for those who feel the BBC is biased and green: “The BBC hates motorists and loves cyclists,” wrote David Vance of the BiasedBBC blog, with not a shred of either irony or proof. The piece also resulted in a fair bit of email via this website. Some of the emails were supportive, others less so. The critical emails were literate and polite and obviously written by intelligent people. 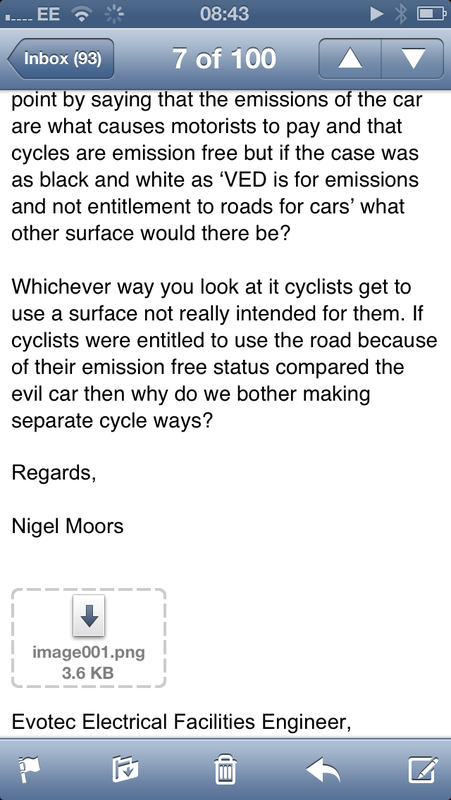 Intelligent people who couldn’t get their heads round the fact cars and bicycles have to share the road and that payment of car tax is a payment for the amount of carbon dioxide any particular car spews out. Those that spew under a set amount of CO2 do not pay car tax. Some of the critics seemed to suggest that as cyclists don’t pay for roads, they shouldn’t be allowed on them, which pretty much proves what the BBC article, and this website, argues: that some motorists don’t know who and what pays for roads and that the “roads are owned by motorists” mindset is a dangerous one for those road users without motors, but most specifically cyclists. Some of the comments also had a very loose grasp of history, claiming that roads were built for the use of motorists. Rather pleasingly this allowed me to reply with one of my other websites, Roadswerenotbuiltforcars.com. I got a few spluttering replies after this but, mostly, the critics went on their merry way. Then today I played email tennis with yet another intelligent interlocutor, a doctor in fact. Not a medical one. No, a doctor who ought to be good at numbers as he’s research fellow at a School of Mathematics at a Midlands university (I’ll spare his blushes by not naming him). He’s right to try and poke holes in this site’s logic but, of course, he’s not the first to use the SORN argument. In fact, this is one the main “trump cards” played by those who say ‘car tax’ is a fee to use British roads. I should point out before anything that the examples on your site of motorists’ anger towards cyclists are obviously ridiculous and unacceptable. As a motorist, cyclist and pedestrian, in each position I see the stupidity of a substantial minority of all three groups, but cyclists are in more trouble because of their precarious positions, not being shielded in metal cages, and being next to those that are in metal cages. is a tax on using the car on public roads, with a SORN exemption if the vehicle is unused or to be driven on private land only. 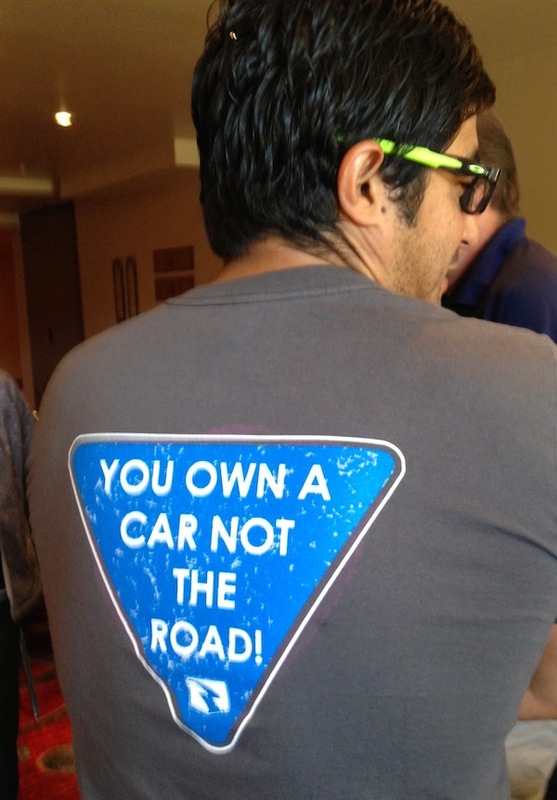 This clear evidence means that VED is not a tax on the car itself, but is a fee to use a car on public roads. 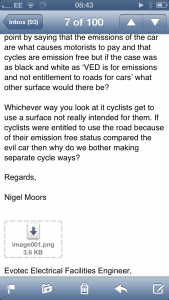 I don’t want to let this detract from your efforts to raise awareness of the attitudes that some motorists take towards cyclists, but VED is a fee to use the roads, and is stated as such by the government. The only reason I am pointing this out is that, for an argument to be made convincingly, no holes in the logic must be present for the other side to pick at, even if in this case the opponents might not have the ability to see them. My boilerplate reply is contained on a number of postings on this website, including the posting about the millions of people, including the queen, who can drive on Britain’s roads without paying VED, and here’s the reply. But car tax isn’t a fee to use the road, it’s very much a tax on car emissions. Many cars, which use the public road, do not pay any ‘car tax’ because they emit less than 100gms of CO2. If car tax was a fee to use roads, electric cars and low-emissions cars wouldn’t be able to drive on UK roads. Nor is it true that vehicles that will be driven off-the-public-highway – on private roads – don’t have to pay Vehicle Excise Duty. The policy intention is to prevent evaders of vehicle excise duty from using off-road areas such as unadopted roads, commons, public car parks or roads maintained by Housing Associations to place themselves beyond the reach of the enforcement authorities. Farmers can get ‘agricultural use’ exemptions from VED for their Land Rovers, so long as they only travel a mile or so on public highways. And in one special circumstance, cars which emit loads of CO2 can still drive on UK public roads without paying car tax. But only for a short distance. When a SORN (Statutory Off Road Notification) vehicle is going to a pre-arranged MOT test, and the vehicle has valid insurance for the journey, it can be driven on public roads without paying a penny for use of those roads. Furthermore, if a car is registered in the UK but is never driven in the UK it still has to pay the UK’s Vehicle Excise Duty. So, a UK-bought car driven in France by a UK-born person who’s moved to France permanently, may never drive on UK roads but the car still has to pay VED. This is because it’s a tax on the car, not a fee to use the roads. This entry was posted on Tuesday, August 20th, 2013 at 8:01 am	and is filed under No such thing as road tax!. You can follow any responses to this entry through the RSS 2.0 feed.